A few more photos now that most of the painting is done. He Who Builds has promised to do the ceiling for me tonight. I can't stand on a ladder, look up, and wave my arms about - not if I want to stay on the ladder. I did put a first coat on the cornices this afternoon, which was about my limit. The cornices are new, so need two coats; the ceiling on needs one coat. My doing the cornices this afternoon means I don't have to wait until tomorrow for everything to be finished. 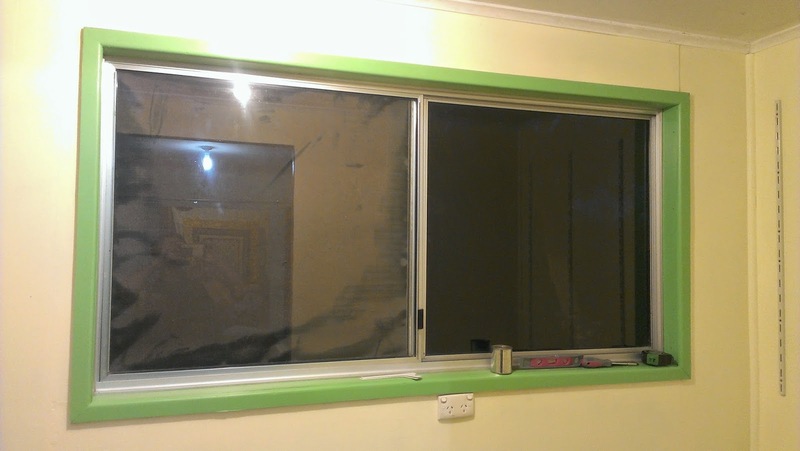 Window frame on all four sides. The yellow walls and bright green accent is through the whole house, except our bedroom and the bathroom, which have a sky blue accent. First lot of shelf tracks reinstalled. 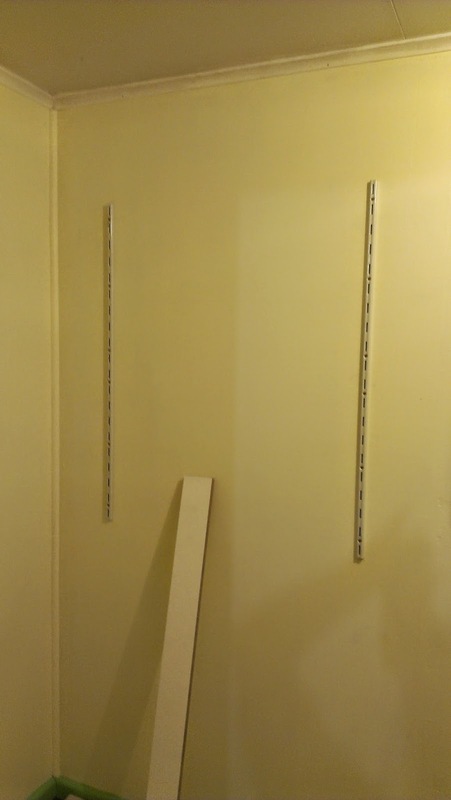 These shelves are 120cm long and various widths. Under these shelves will be my cutting bench and most of my fabric stash. 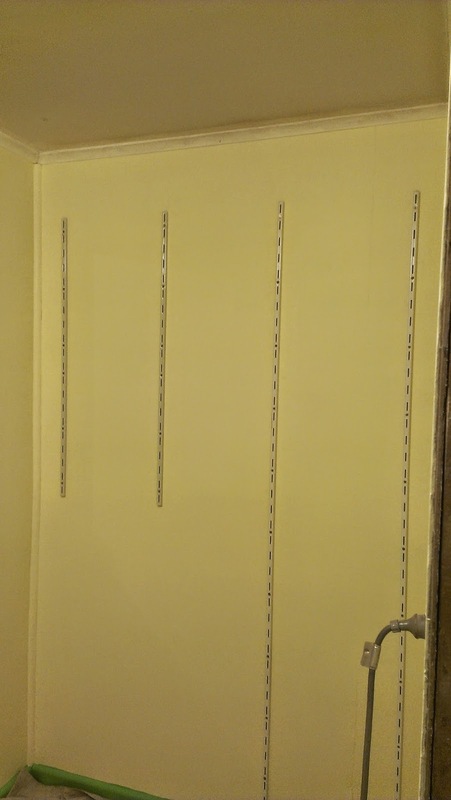 These shelves are on a narrow wall (1.4m). The shorter lengths are over the end of my main sewing desk. I've planned a mix of full length shelves and half length (to use some shorter shelves I already have). I'm considering a wider 'shelf' at the same level as my desk top, as an expanded area for light-weight work. I definitely wouldn't put a sewing machine on one of these shelves, but paper trimming, or writing, or the like would be fine. 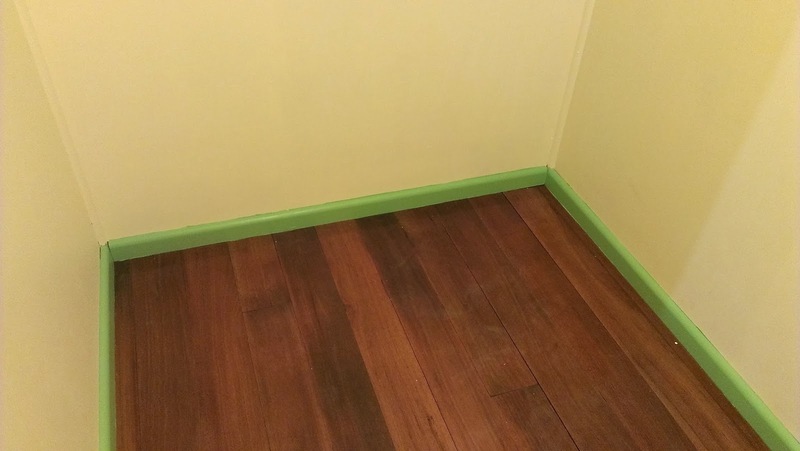 New floor boards (so pretty) and skirtings. I learnt today that skirtings are hard work to paint. I think perhaps it would have been easier to paint the whole lot before they were installed. A new paint brush, with no bent or damaged bristles is an imperative. I can see my 'woopsies', but a blind man galloping past on a horse on a moonless night probably can't, so I'm not too fussed. Reality is, most of the skirting will hidden by desks and storage. Tomorrow or maybe Thursday I might be able to post some "after" photos. So exciting, love the lime and yeah, you are so right, with the furniture installed little overruns will not be noticed! So impressed with your ingenuity in making the most of your space. We get a lot of people give us an, "Oh, really?" look when we say 'yellow and green', but when they see it, they realise that it does actually work, and work well. The yellow is a lovely, fresh, bright, but almost-neutral colour, and the green is very spring time, sunny, bright. We have a third shade, which is kind of spearmint milkshake green. We use that for larger accents - shelves and so forth. I chose the colours from curtains in the Teen's bedroom. I sat for ages with dozens of paint chips, matching shades and then working out which ones to go with. Of course, I can't find any new curtain fabric that works with the colour scheme, which is one reason why I'm leaning towards wooden blinds instead. Sewing Room - re-jigged cutting table.